We produce best quality edible oils in a high tech and hygiene environment which is built on ancient traditional oil extraction system of Sri Lanka. We started as a modest small industry in a pristine rural set up in Masalawatta, Horawala village of Kalutara district, in Sri Lanka's Western Province. In this traditional Sri Lankan wet zone culture, our people believe food and beverages are sacred and they must be offered uncontaminated with love and care. We select best coconut and copra from the island and extract oil using traditional and advanced technologies which are close to nature. We add nothing but human values in production process and always try our best to bring the best quality product for you. We have a wonderful team which is bound together with great values and teamwork. We guarantee that we will try our best to deliver your expectations. 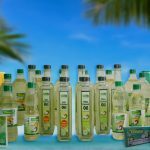 We produce best quality Coconut Oil, Refined Coconut Oil, and White Coconut Oil. We also import and distribute Palm Oil. Our great team is now planning to produce Virgin Coconut Oil. Our great team and Their human values are the most valuable asset of our company. They will select best quality raw material and work hard to produce not only the most hygiene edible oil but also your expectations.